The Crook County Cowboys golf squad is showing improvement. Despite high winds and occasional rain, the Cowboys shot their best round of the year on Friday as they finished third in the eight-team Meadow Lakes Invitational. "I thought it went pretty well again," Crook County head coach Zach Lampert said following the tournament. "We had some tough weather at times. The wind was howling, and we had a little squall of rain, but we still played pretty good." Led by an 80 from Brodie Kuizenga, the Cowboys fired a round of 353, better than any round they shot in 2018. Kuizenga finished in eighth place overall, after shooting the best round of his career. It was the second consecutive tournament where Kuizenga has shot under 90. "He had a really good front nine," Lampert said. "He was even par on the front nine. He struggled a little bit when the weather really kicked in, but overall, a really good day for him." Kuizenga was not the only Cowboy to shoot a career best. Trenton Brinkley scored in the 80s for the first time in his career, firing a round of 87 to finish 14th in the tournament. "Trenton got in the 80s for the first time," Lampert said. "I think now that he broke that barrier he can be in the 80s more down the stretch." Rounding out the scoring for the Cowboys was Hogan Smith with a round of 90 and Cayden Lowenbach with a score of 96. Addison Smith was the fifth golfer for the Cowboys, finishing with a round of 99. Crook County also played two golfers who did not count in the scoring. Carlos Sanchez posted a score of 98, while Tannon Joyner struggled, shooting a round of 130. "Carlos and Addison were real neck and neck," Lampert said. "Carlos was 98 and Addison was 99, so Carlos is going to play Monday in the league match, but we get to take all six of them, just the sixth score won't count for the team." Lampert added that Joyner did not have his best round as he struggled with control in the windy weather. "He just never could get going," Lampert said. "He was a little high for him. He had a good attitude, but a rough day; one of those that you just throw out the window and move on to the next one." Ridgeview's Isaac Buerger took medalist honors, firing a one-under par 71, to finish four shots ahead of Myles Sanchez of Summit. The Storm entered two teams in the tournament, placing first and second overall in the team scoring. Sanchez, who played for the Summit B team, shot a round of 75. Playing for the Summit A team, Jackson Murphy and William Fleck finished third and fourth with scores of 76 and 77, respectively. Luke Bundy of the Summit B team finished next, also posting a score of 77, while two members of the Summit A team finished sixth and seventh. Summit's A team fired a round of 310 to win by five strokes over their B team, which posted a score of 315. "They are short a couple of tournaments that got canceled, so they brought over 10 guys, and they got first and second," Lampert said. "They are really deep." The Cowboys' round of 353 put them in third, four shots ahead of Ridgeview, which posted a round of 357. Ridgeview could easily have been third, but their No. 2 golfer made an error and was disqualified from the tournament. "Ridgeview was right behind us, and their No. 2 kid was disqualified for hitting the wrong ball," Lampert said. "He didn't fix the error, and he teed off on the next hole without fixing the wrong ball error. If they wouldn't have had that happen, they would have beaten us by a couple, so they are tough." Rounding out the scoring was La Pine in fourth with a score of 378, Redmond fifth, 384, Mountain View sixth, 477, and The Dalles eighth. 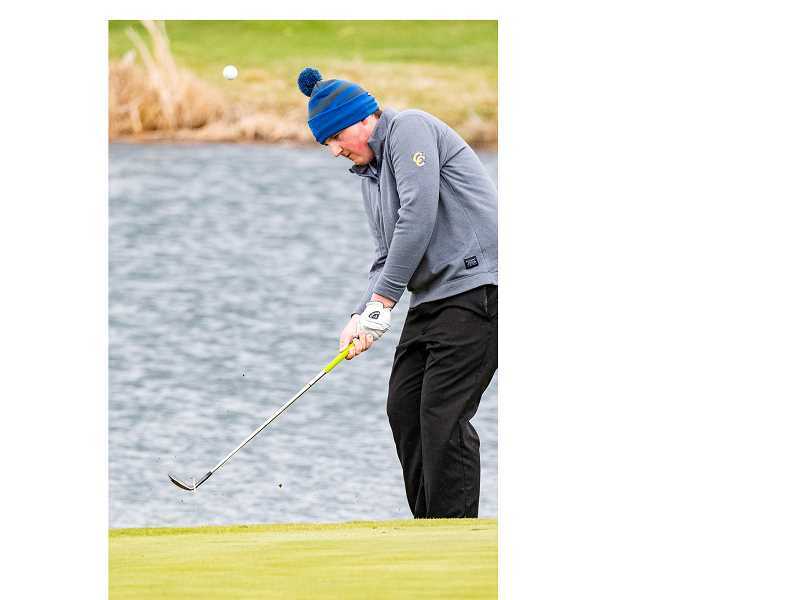 The Dalles failed to earn a team score for the tournament as they had just two players finish the event. The Cowboys traveled to Hood River Valley on Monday for the first of four Intermountain Conference tournaments. The top team at the end of the four events earns an automatic berth into the state championships, while the second through fourth place teams will go to a regional tournament in an effort to qualify. That means that a lot was on the line when players teed off at noon on Monday. "We have to all be on our game," Lampert said. "We have to all pack together and hope that that's good enough. I'm encouraged that the team scores are better than a year ago. They are getting a little confidence and moving forward, we will see what happens. We've never had a league match that counted before, so we are breaking new water here." Following Monday's league match, the team will play on Thursday, April 11 in a noon start at Tokatee Golf Course on the west side of Santiam Pass. The tournament is being hosted by Summit, which is still unable to host a tournament on their home course in Bend. Team scores — Summit A, 310. Summit B, 315. Crook County 353. Ridgeview 357. La Pine 378. Redmond, 384. Mountain View, 477. Medalist — Isaac Buerger, Ridgeview, 71. Top 10 — Isaac Buerger, Ridgeview, 71. Myles Sanchez, Summit B, 75. Jackson Murphy, Summit A, 76. William Fleck, Summit A, 77. Luke Bundy, Summit B, 77. Hayden Klein, Summit A, 78. Lucas Hughes, Summit A, 79. Brodie Kuizenga, Crook County, 80. Jimmy Plumleigh, Summit B, 81. Sam Renner, Summit A, 82. Crook County (353) — Brodie Kuizenga, 80, Trenton Brinkley, 87, Hogan Smith, 90, Cayden Lowenbach, 96, Addison Peer, 99. Not Counting in team scoring, Carlos Sanchez, 98. Tannon Joyner, 130.